In this innovative, wide-ranging synthesis of anthropology and biogeography, Alexander Harcourt tells how and why our species came to be distributed around the world. He explains our current understanding of human origins, tells how climate determined our spread, and describes the barriers that delayed and directed migrating peoples. He explores the rich and complex ways in which our anatomy, physiology, cultural diversity, and population density vary from region to region in the areas we inhabit. 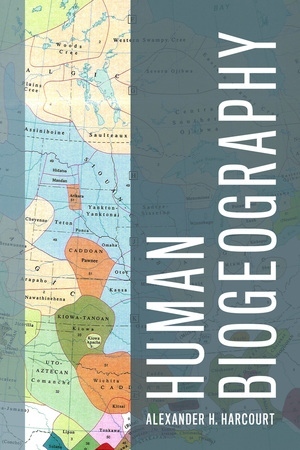 The book closes with chapters on how human cultures have affected each other’s geographic distributions, how non-human species have influenced human distribution, and how humans have reduced the ranges of many other species while increasing the ranges of others. Throughout, Harcourt compares what we understand of human biogeography to non-human primate biogeography. Alexander H. Harcourt is Professor Emeritus in the Anthropology Department at the University of California, Davis. He is the coauthor of Gorilla Society and coeditor of Coalitions and Alliances in Humans and Other Animals.